Or get the Fairy Tarot Deck & Book Set. Back of card: Green monotone of a helmeted male fairy sitting on the back of a wild boar. It's reflected top & bottom, so you can invert these cards. Booklet included: No, but there is a long folded piece of card with 20 panes. Once unfolded, you'll never get it folded correctly again. Each pane: 2.6 x 4.65 inches, or 66 x 118 mm. 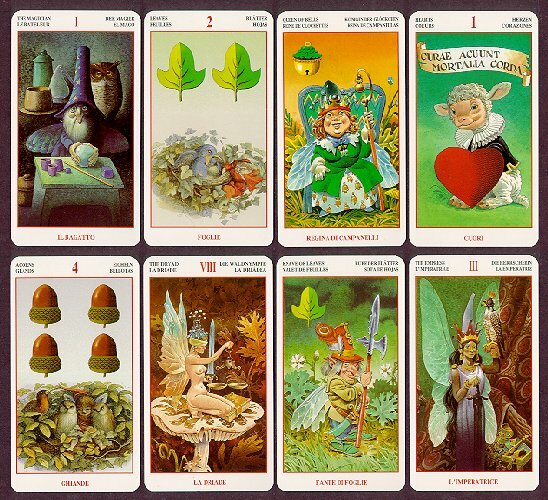 Comments: In this whimsical deck, the suits are Hearts, Bells, Acorns & Leaves. It's a little murky, but I believe Hearts are Cups, Leaves are Spades, Acorns are Wands, and Bells are Pentacles. (It's not given in the notes with the deck.) Face cards are Knave, Knight, Queen & King. Though the instructions are in English only, the cards are titled in Italian on the bottom, with English, French, German & Spanish printed across the top.